Due to changes in the fishing licensing system we will no longer be selling fishing licenses at the resort. Licenses can be purchased and printed from home by visiting https://gowild.wi.gov/ or can be purchased at the Edgewater Store. All annual licenses are valid from April 1 through March 31 of the following year. *Children under the age of 16 do not need a fishing license. Family licenses include spouse and children ages 16 or 17. Children 16 or 17 not on a family license need their own license. LAKE MAPS of Big Chetac & Birch Lake are available at the resort. to fish with more than three hooks, baits, or lures. MOTOR TROLLING (& back trolling) is permitted. 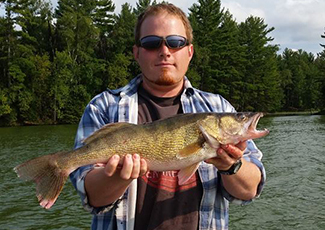 Complete fish regulations available at the resort or at WI DNR Website. LIFE VESTS – All passengers on watercraft must have a wearable life vest. These are available for no charge at the resort. Persons 10 years but less than 12 years of age may operate a motorboat if accompanied by a parent or guardian or person at least 18 years of age. Persons at least 12 but less than 16 years of age may operate a motorboat only if accompanied by a parent or guardian or by a person 18 years of age or older or if they have successfully completed a Department of Natural Resources prescribed Boating Safety Course and possess a safety certificate issued by the Department of their state. The information presented above is summarized from the “Guide to Wisconsin Hook and Line Fishing Regulations”and “Wisconsin Boating Regulations” For further detail, check these publications available at the resort. Please be aware that this information may change without notice.